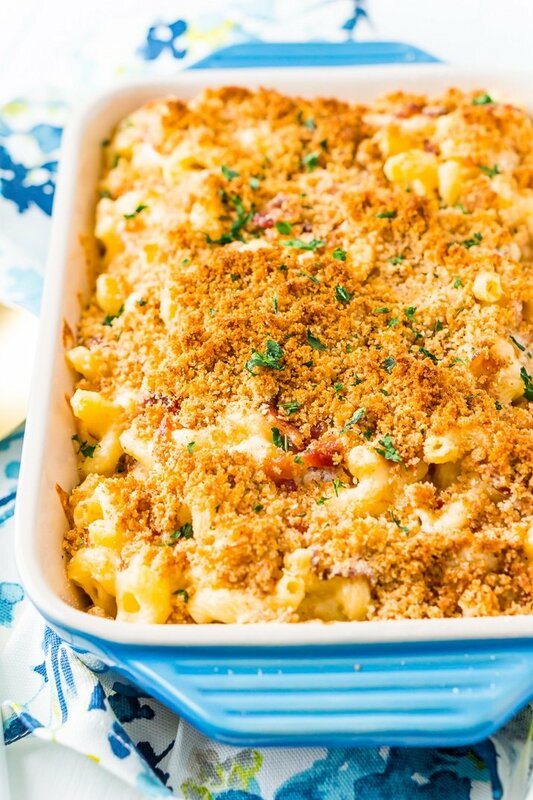 This Three Cheese Bacon Mac and Cheese is loaded up with crispy baked bacon and three different kinds of cheese, it’s to die for! I’m a sucker for Mac and Cheese. It’s kinda the ultimate comfort food, am I right? Now when I say that this Three Cheese Bacon Mac and Cheese recipe is to die for, I mean that pretty literally. I’m pretty sure I can actually feel it clogging my arteries as I eat it, but it’s just so good I can’t help myself. I mean bacon, pasta, and cheese… it’s like the perfect combo! So if in the end, it’s the Mac and Cheese that gets me, well, at least it was something I enjoyed. But I’d die 1,000,000,000 times happier if I got to follow it up with Banoffee Pie before meeting my fate. After all, I am a dessert kinda girl! JUST TAKE ME TO THE BACON MAC AND CHEESE RECIPE ALREADY! 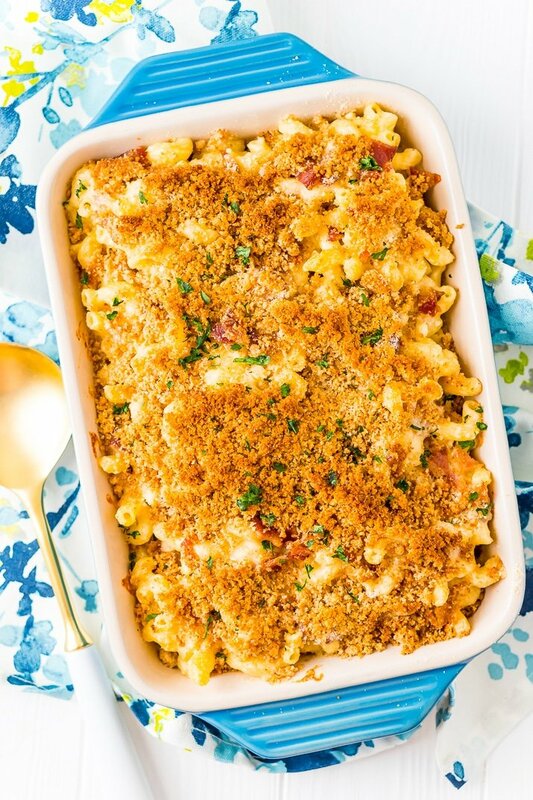 If you’d rather skip my (very helpful, I think) tips and tricks, essential cooking info, and similar recipe ideas – and get straight to this deliciously easy Best Ever BACON MAC AND CHEESE Recipe – simply scroll to the bottom of the page where you can find the printable recipe card. 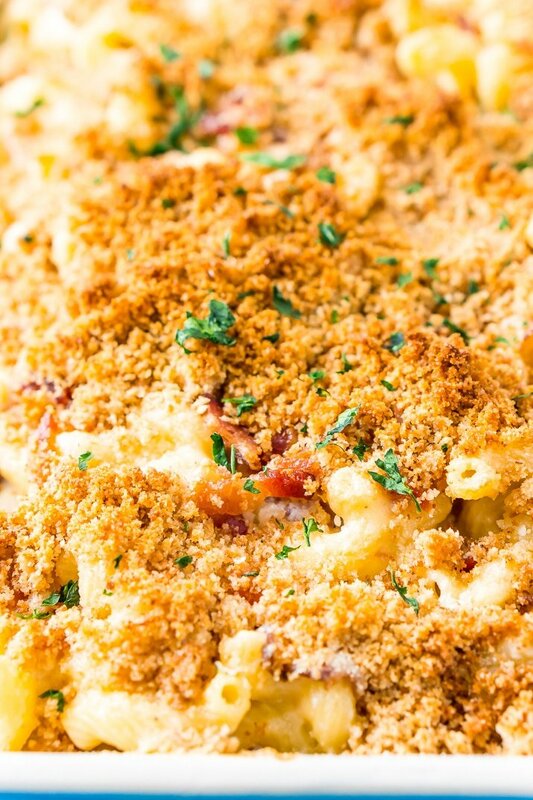 This recipe was actually inspired by Longhorn’s Steakhouse Bacon Mac and Cheese! I have to get it every time we go there and decided that I really needed to make a copycat recipe at home. I might be being a little biased, but I think I nailed it! 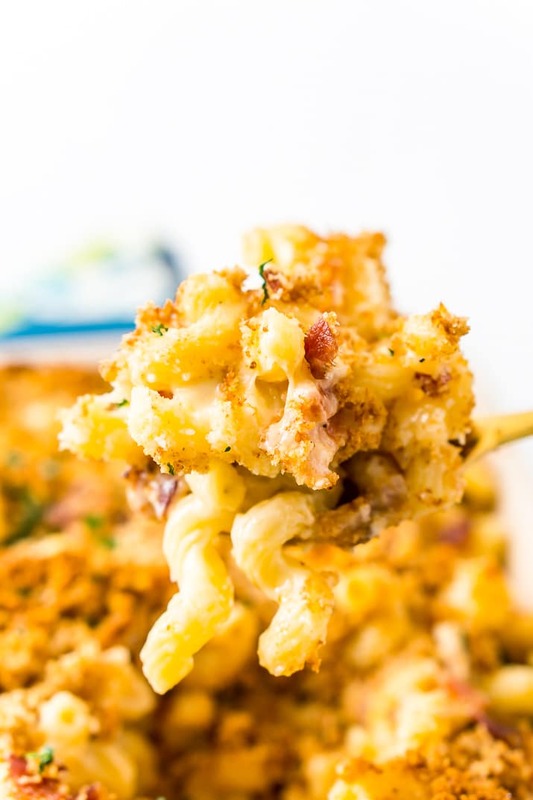 This Bacon Mac and Cheese is one of the first recipe ever posted here on the blog, and it was finally time to update photos and the recipe. This is one of those recipes that reminded me just how far I’ve come. Even with poor quality photos, this recipe has always been popular and I hope you’ll all give it a try and enjoy it as much as we do! It’s the perfect comfort food and great for snowy days trapped inside! If you want a leaner cozy recipe, try my Healthy and Easy Turkey Chili. Don’t forget to pin this recipe for later! This delicious comfort food recipe is really simple to make and you can even cook your bacon up ahead of time to make it even quicker! 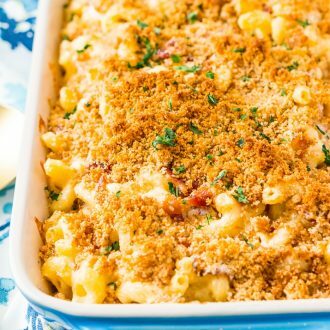 We usually cook up a whole pound of bacon and enjoy some for breakfast and add the rest to this mac and cheese for dinner! 1. Begin by preheating the oven to 400 degrees F.
2. Place two cooling racks on top of a jelly pan and lay the bacon out on it, the bacon can be touching to start, it will shrink up during cooking, and bake bacon for 15 – 18 minutes. Once bacon finishes cooking, transport it to a paper towel-lined plate to rest. 3. Turn oven down to 350 degrees F.
4. Bring water to a boil in a large pan, making sure to salt it. Once boiling, add in pasta and cook until Al dente. 5. While pasta and bacon are cooking, add butter and heavy cream to a medium saucepan. Once butter has melted, whisk in flour and seasonings and allow to simmer for a couple of minutes. 6. Whisk in 1/2 cup of Parmesan cheese and the other cheeses one at a time until completely melted, continue to simmer for a couple minutes, stirring occasionally. Add additional salt and pepper to taste. 7. Once pasta had finished cooking and has been drained, put it back in the pan and then pour cheese sauce over it. 8. Chop up bacon and transfer to the pan and stir it in and transfer mac n cheese to a medium-sized casserole dish. 9. Add breadcrumbs and 2 tablespoons of butter to a medium skillet and toast until breadcrumbs are golden brown. Remove from heat and add the Parmesan cheese. Sprinkle the breadcrumbs over the top of the mac and cheese. 10. Bake for 20 minutes and enjoy warm. This post was originally published March 20, 2013. 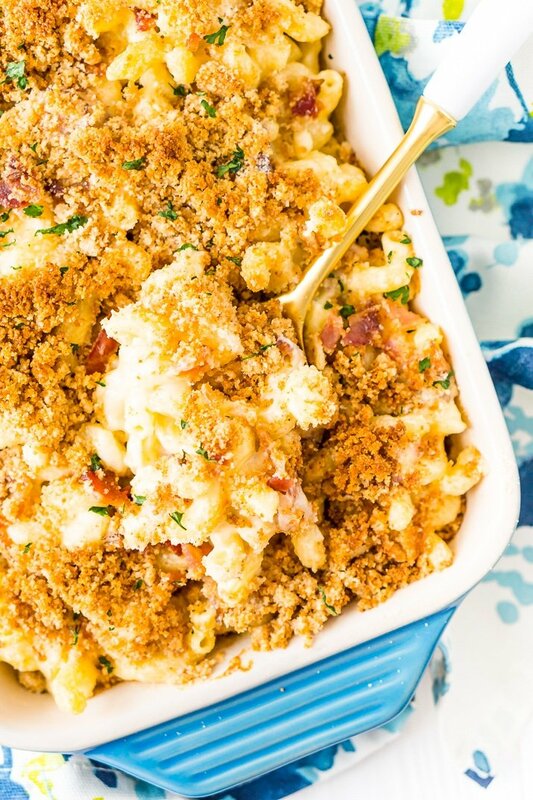 This Three Cheese Bacon Mac and Cheese is loaded up with crispy baked bacon and three different kinds of cheese, it's to die for! Place two cooling racks on top of a jelly pan and lay the bacon out on it, the bacon can be touching to start, it will shrink up during cooking, and bake bacon for 15 - 18 minutes. Once bacon finishes cooking, transport it to a paper towel-lined plate to rest. Turn oven down to 350 degrees F.
Bring water to a boil in a large pan, making sure to salt it. Once boiling, add in pasta and cook until Al dente. While pasta and bacon are cooking, add butter and heavy cream to a medium saucepan. Once butter has melted, whisk in flour and seasonings and allow to simmer for a couple of minutes. Whisk in 1/2 cup of Parmesan cheese and the other cheeses one at a time until completely melted, continue to simmer for a couple minutes, stirring occasionally. Add additional salt and pepper to taste. Once pasta had finished cooking and has been drained, put it back in the pan and then pour cheese sauce over it. Chop up bacon and transfer to the pan and stir it in and transfer mac n cheese to a medium-sized casserole dish. Add breadcrumbs and 2 tablespoons of butter to a medium skillet and toast until breadcrumbs are golden brown. Remove from heat and add the Parmesan cheese. Sprinkle the breadcrumbs over the top of the mac and cheese. Bake for 20 minutes and enjoy warm. This looks delish. How many will it feed? We usually get dinner and a couple of lunches out of it. I would say it could safely feed 6 or so with a side of garlic bread. What a yummy dinner idea! My little kiddos would love this dish. I will have to try it for them very soon! Thank you for sharing. PINNED! Yum! This sounds delicious! Thank you for sharing on Found & Foraged! I lo-ove mac n cheese and if you add bacon, then I’m over the moon. Thanks for sharing at the This Is How We Roll Link Party on Organized 31. Thanks so much Katherine, I’m so glad you loved it! Thank you for stopping by and linking up to Pretty Pintastic Party. I pinned this delicious looking Mac & Cheese. I totally agree that it is the ultimate comfort food. YUM! Yours looks wonderful with the bacon. We made it again yesterday, it’s the best! Thanks so much for stopping by! This looks TO DIE FOR! On my to-do list for this week for sure! Found you through Tatertots & Jello – thanks for sharing! I love this recipe! We make it all of the time in the oven, but I am wondering if it is possible to make/serve it in the crockpot so that it stays warm? What would you recommend as far as cook times/heats if we were to make it in the crockpot? Hi Elizabeth, I’m so glad you enjoy the recipe, I actually made it this weekend, it’s one of our favorite comfort foods! So the thing with making this recipe in the crockpot is that I’m not sure it would really save you much time, you would still need to build your roux in a pan and cook your bacon and pasta separately. I guess you could add it to a crockpot after mixing everything together and then add the breadcrumbs and leave it in there to keep warm instead of baking in the oven. Elizabeth, have you try this in the crockpot yet? I am curious about the same thing. We absolutely love this dish but with practices every night, it hard to find time to make it. Could this be frozen and baked later? Hi Meranda, I’ve never tried it myself but I’m sure it could be done.